Only four ranked teams in all classifications lost in Week 5 action, but the teams that did fall were some of the state’s best. The top two teams in Class 6A both lost in Week 5 as did the No. 1 team in Class 5A. Here’s a look at the Kpreps Top 5 for Week 6. Lawrence is the new No. 1 team in Class 6A this week after losses by Shawnee Mission East and Blue Valley on Friday night. The Lions, once the dominant program in Kansas, rolled to 5-0 with a 42-6 win over Shawnee Mission South. The Lancers of Shawnee Mission East fall one spot to No. 2 after a 32-20 loss to Lawrence Free State. The loss snapped the Lancers 17-game winning streak dating back to their runner-up finish in the 2013 state championship game. Wichita Northwest checks in at No. 3 this week. The Grizzlies continue to roll behind an explosive offense led by quarterback Kevin Folsom. Blue Valley falls two spots to No. 4 this week. 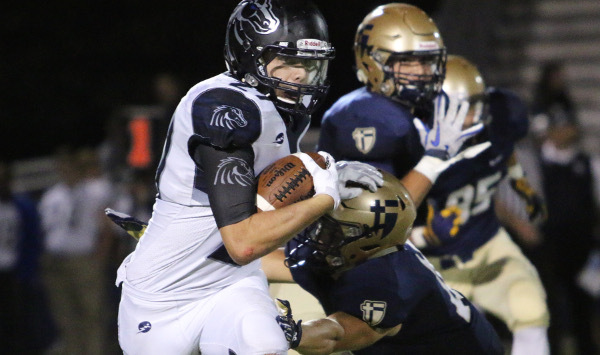 The Tigers led 27-10 in the fourth quarter, but Blue Valley North scored two touchdowns in the final 1:15 to pull off a shocking 28-27 win. Finally, Derby is ranked fifth in this week’s poll after a 57-0 shutout of Newton. Despite a loss on Friday, Mill Valley remains at No. 1 in Class 5A. The Jaguars fell 28-21 to Staley (Mo. ), the third ranked team in Missouri Class 5. The remainder of the Class 5A poll also remains unchanged. Bishop Carroll is ranked second followed by No. 3 St. Thomas Aquinas. Aquinas is on the road this week at 6A No. 4 Blue Valley. Pittsburg remains No. 4 after cruising past Parsons, and St. James Academy is ranked fifth. Thunder quarterback Trey Keith accounted for more than 320 yards of total offense and four touchdowns in a win over Lincoln College Prep (Mo.). The top five in Class 4A-I remains unchanged this week as all five teams posted wins by at least 24 points. Of note, No. 4 Ulysses got 187 more yards and three touchdowns from Ian Rudzik who now has 1,230 rushing yards and 14 scores this season. Andover Central welcomed back quarterback Peyton Huslig from injury, and the No. 5 Jaguars used a big second half to beat Goddard-Eisenhower 37-13. In Class 4A-II, the bottom part three spots in the poll saw changes this week as Holcomb moved back up to No. 3 after beating Colby. The Longhorns moved up one spot to replace Holton which fell out of the poll after a third loss on the season. Osawatomie moves up one spot to No. 4 this week. The Trojans beat Anderson County 49-24 behind another big performance from Riley England. England rushed for 287 yards and six touchdowns in the win to push his season total to 1,331 yards and 16 scores. The Royal Valley Panthers enter the top five for the first time at No. 5. The Panthers have won four straight games after a season-opening loss to still-unbeaten Abilene. For the first time all season we have some movement in the Class 3A poll. The movement is slight, however, as Wichita Collegiate moves up to No. 2 this week just ahead of No. 3 Scott City. Our voters flipped the Spartans and Beavers places this week by just a few votes. Halstead remains No. 4 in the poll, while Silver Lake comes in at No. 5. This week watch for No. 3 Scott City as they travel to take on 4A-I No. 4 Ulysses in the battle for the Greater Western Athletic Conference Championship. The top five in the Class 2-1A poll also remains the same this week. Meade keeps the top spot after a dominant win over Syracuse, while Sedgwick edges out Smith Center by only one vote to remain in the No. 2 spot. Phillipsburg is ranked fourth this week and prepares for a big game at home against No. 2 Sedgwick. Finally, Marion survived a scare to remain unbeaten at No. 5. The Warriors scored midway through the fourth quarter to top Chase County, 14-13. The 8M-I top five also remains the same this week. Spearville and Central Plains remain in the top two spots after posting shutouts this week. The Royal Lancers have shut out three opponents this season, while the Oilers have posted four shutouts. Third-ranked Solomon picked up a good district win over Ellinwood, while Hanover dominated a district showdown with Mankato-Rock Hills, 50-16. Burlingame remains in the No. 5 spot this week, but the Bearcats will get perhaps their biggest test of the season at Rural Vista this week. Victoria remained unbeaten in 8M-II with a win over Northern Valley. The No. 1 Knights should get a test from Beloit St. John’s-Tipton this week. Second-ranked Sharon Springs-Wallace County survived a solid test from Triplains-Brewster, 24-6. Argonia-Attica remains ranked third. The Titans blasted Caldwell 59-0, while No. 4 Otis-Bison shutout Thunder Ridge, 50-0. Pretty Prairie, ranked fifth, posted its fourth shutout in five games this season with a 50-0 win over Norwich. The Bulldogs have only surrendered eight points all season, but the competition will ramp up with a showdown with No. 3 Argonia-Attica looming in two weeks. Visit the Rankings page each week to view a complete list of the top five teams in each classification and how they performed last week.